The below instructions are for setting up your TV and cable box to work on your Xbox One system. Plug your cable box HDMI cord into the HDMI in port on your Xbox One. Your TV should already be connected to the HDMI out port. Now, go to Settings -> TV & OneGuide and click on the OneGuide option at the top. On the initial setup, you will need to select your cable or satellite provider and the channel lineup. You do this by selecting your cable provider, entering in your zip code, and giving all other cable box information. If the lineup is incorrect after you have put this information in, you can try to troubleshoot the issue here. Now go back to the OneGuide menu and select Devices. Here you will search for your TV brand in the drop-down menu. Note that the your TV my not be listed and you can manually enter in your TV information by hitting "I don't see my brand." If you find that your TV is not compatible, you will not be able to use your cable through the Xbox One, but will still be able to play games. If you find your TV, you will now need to enter in the brand of your cable box. 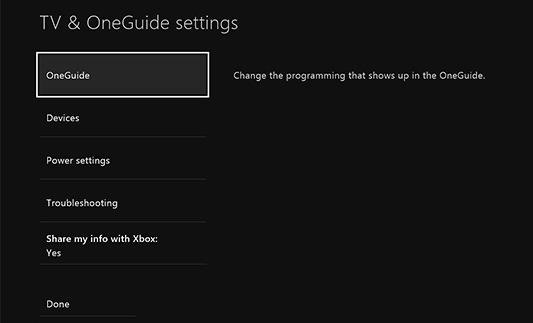 After that you should go to the Power Settings to change how your Xbox One controls your cable. For example, you might want the voice command, "Xbox turn off" to turn off your cable box instead of your Xbox or vice versa. For more details, you can check out the Xbox support page or watch the following setup video by CNET's Dan Graziano. Now that you have everything set up, it's time to start enjoying your cable on the Xbox One. Will you use your Xbox One for your cable needs or separately? Let us know in the comments section.